In the past few decades there has been an explosion of interest in the period of late antiquity. Rather than being viewed within a paradigm of the fall of the Roman Empire, these centuries have come to be seen as a time of immense creativity and significance in western history. 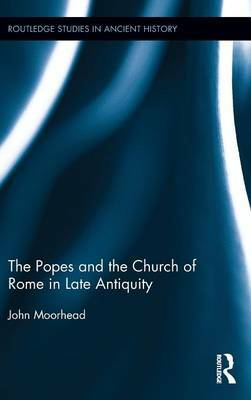 Popes and the Church of Rome in Late Antiquity places the history of the papacy in a broader context, by comparing Rome with other major sees to show how it differed from these, evaluating developments beyond Rome which created openings for the extension of papal authority. Closer to home, the book considers the ability of the Roman church to gain access to wealth, retain it in difficult times, and disburse it in ways that enhanced its authority. Author John Moorhead evaluates patterns in the recruitment of popes and what these suggest about the background of those who came to papal office. Structured around a narrative of the papacy's history from the accession of Leo the Great to the death of Zacharias II, the book does more than tell what happened between these years, applying new approaches in intellectual, cultural, and social history to provide a uniquely deep and holistic study of the period. "...the grand sweep of the late antique Roman episcopate is here, told through the stories of individual popes moving through the changing landscape of Late Antiquity. The sources are mostly used wisely. The relative importance of each pope is considered. And broader themes of the history of Late Antiquity are not lost in individual stories. This volume, then, can be read with profit by scholars both of the church and of Late Antiquity. It will also be a welcome addition for teaching."